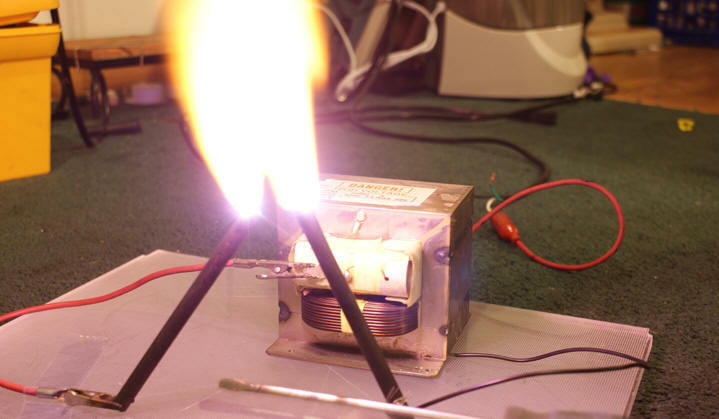 The microwave oven transformer is possibly one of the simplest methods of making some big high voltage arcs, mainly because they are robust, cheap, and easy to hook up. To the bottom left I have a picture of an MOT. The mains input is two blade connectors on the primary coil (thick wire). All you need to do is give power to those connections via a lamp cable or some other means and you’ve got 2,200V coming out of the thing. But where does the 2,200V come out? Well, the HV output is a single blade connector on the secondary coil. It usually puts out around 2,200V at 1 amp (2,200 watts); certainly more than enough to kill you, so… DO NOT make contact with the high voltage! Seriously, DO NOT. However, just because something can be deadly doesn’t mean that it must be. Just don’t touch the HV output and you’ll live to tell stories about the MOT and its wonderful arcs (which are insanely bright). 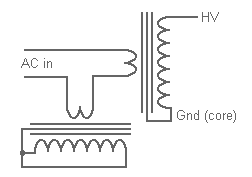 The secondary ground is connected to the transformer’s core, and it is neutral. MOTs are a mass produced item and these days quantity is more important than quality. Because of this, they are designed with as little iron as possible and drawing an arc often saturates the core. Once a transformer is saturated it starts to draw a lot of extra amps; amps that do not make it to the secondary coil, but instead are wasted as heat. An MOT in saturation is likely to trip your circuit breaker and that’s no fun. To prevent excessive current draw MOTs are usually ballasted, and this can be accomplished a couple different ways. By far the simplest method is just to use a long wire wrapped around some steel rods. Anything greater than 50 or so turns around 25 or so 5mm rods should limit the current enough that the MOT doesn’t trip your circuit breaker, and if you like, it’s possible to use a PVC tube form to allow for removal of the rods. Less rods = less inductance = more current. A third method of ballasting MOTs is to use a resistive ballast. Halogen lamps (the big 500W work lamp kind) make pretty good resistive ballasts. All you need to do is put one in series with the transformer’s primary to limit its ability to draw current. Make sure you find a non-combustible way to mount them since those things get hot! Also, since they are glass don’t touch them you as your finger oils will burn when the lamp is powered up and the resulting carbon will get hot enough to shatter the bulb. Since MOTs are nothing but copper and iron they can be modified a couple different ways. One such modification is to knock out the magnetic shunts. 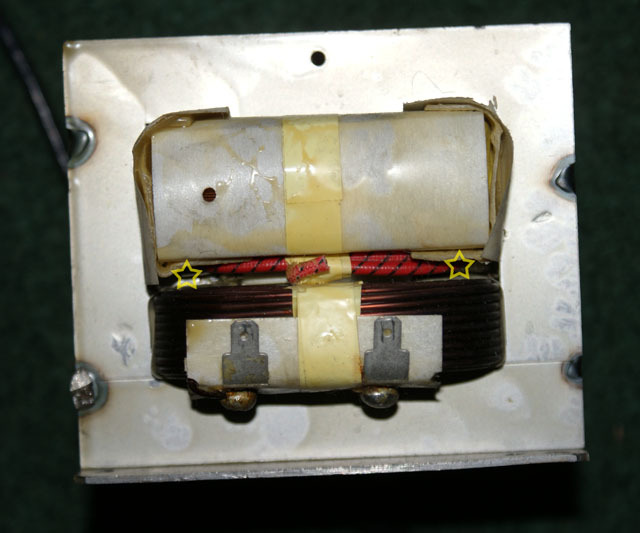 The magnetic shunts marked in this picture increase the leakage inductance of the transformer, and this limits the current somewhat. If you want more current out of the HV side for some reason you can knock out these shunts using a hammer and a chisel. It takes a bit of doing but it’s certainly possible, and once the shunts are knocked out you should be able to get more current out of the secondary, and thus longer, hotter arcs. Another possible modification is to turn the MOT into a nice low voltage high current transformer, and I discuss that in detail on this page. Here I have a youtube video of some unballasted MOT arcs. Great explanation here as to how to wire the MOT’s up. Some sites and videos found on You Tube seem to make it sound sooo difficult. I’m interesed in built a MOT to 12 volts high current to power a 500 watts car amplifier,I know how to do it, but my question is if the transformer get hot I ‘m thinking to put two pc’s fan to keep it cool . So it would be work for my amplifier plays some music for at least a couple of continuos hours? Thanks. Just get a real filament transformer; you won’t be disappointed. man i need some help about quad mot supply can you help me? what is the core material quality M5, M6, or what ? It’s anyone’s guess, but in any/all cases it’s probably not a very good material. Remember, these things must be produced for $5! I’m interested in building a pulsed DC electromagnet (stationary) to create eddy currents in an aluminum plate above it, causing the plate to levitate on the opposing magnetic field. Pulsed so that its magnetic field is time-varying and always oriented as North facing up. Having a hard time finding pulsed DC power supplys. Got one rated at about 400 watts that I can connect to the primary coil of a microwave oven transformer pulled out of its enclosure. Otherwise, I have to use a 12V power supply and run it through a pulse width modulator to a primary coil. Any suggestions? I’m not a student, just a truck driver addicted to physics. P.S.-Love the slogan. I’m a child who has survived electrocution, that’s why I’m so cautious! Great website, appreciate your time and effort. Jim. It would need pulse-width modulation anyway to control the distance of levitation. add 20 turns to the primary pf the MOT and it runs much cooler. What are your thoughts on using a MOT in reverse as a step down transformer? Putting 230V into the 2000V side should give a nominal 26V or so. This seems like an ideal voltage for a soldering iron or other heavy 24V load. 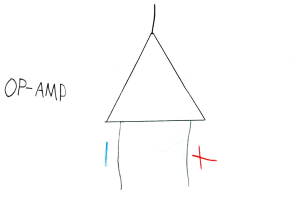 Carefully disconnecting the core connection means that it can be earthed and the HV side then connected safely to mains. I have removed the filament winding and read 26V on the old primary with just 15mA magnetising current on the input side. I am guessing it will never approach saturation with the very generous number of turns but should be able to deliver at least 2000/230 or the old rated current in the windings. Which may have been around 4-8A in the old primary and now 1/8 of that. This seems a bit weak but should be pretty bullet proof. Should I remove the iron shunts? Thanks for your thoughts, I think I have established that it will be very heavy for what it can deliver but should cope with a 50W soldering iron. I tried it out and the 40W soldering iron element loaded the 26V to about 6V. It looks like the inductance and resistance of the HV winding is too high to push through any significant amount of power. I suppose I will have to rewind the thing now. At least it will be easy to remove th shunts with the HV winding out of the way. I would cut the secondary windings off and discard them without disturbing the core. Then I would remove the shunts and count the existing primary windings. It will be around 1 Volt per turn for 230Vrms input. Say you count 255 turns without disturbing the primary coil in any way. Bearing in mind that the MOT is made with the smallest possible magnetic core section and smallest length and dia of copper wire and cheapest core materials, I would add 50 turns to the ‘primary’ by carefully feeding copper wire through the transformer window in series with the existing primary wound on a protective cardboard base. Use the space where the shunt used to be. That will lower the core flux by 20%, taken the MOT sufficiently out of saturation, lowering heat in the primary coil and raising the efficiency. In the same manner I would wire the new secondary with AWG18 (1mm diameter) wire… resourced from another MOT if you don’t have anything else. Wire around 40 turns of copper wire as your “secondary” using the same method giving you 30 Volts RMS at idle. The copper wire allows for 2.3 amps on the secondary, giving you around 60 VA of power at 26 or 27 volts under load (for use with your soldering iron). Best to lay a second set of 40 turns as additional ‘secondary’ to utilize extra space within the existing core window of your modified transformer. You now have the choice of running the two secondary coils in parallel, thus doubling the cross-sectional area of the copper wire on the secondary, being able to draw 4.0 to 4.6 amps at 27 or 28 volts or so under load, supplying now ~110 VA of power. You can also wire them in series for 60 Vrms applications. That will almost allow for building a regulated 50V power supply (allowing for ripple current, bridge rectifier and regulator voltage drops/efficiency-related losses and input voltage fluctuations). You can of course use heavier wire if you have any since you are able to utilize surplus power from the existing core configuration.